Can any user use sudo? What is a sudo session? So what's the solution to this problem? Simple, use the sudo command. The user who is running the command will be prompted for their login password. Once the correct password is entered, the operation will be performed successfully. 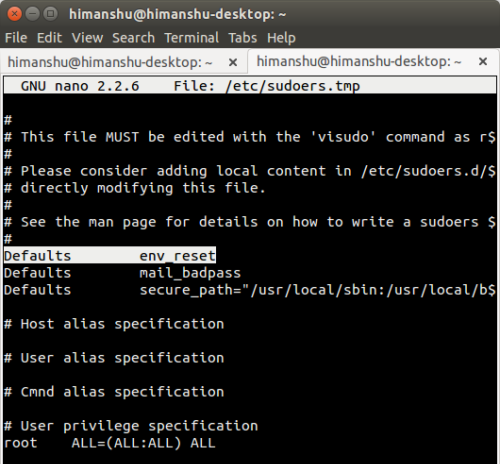 While sudo is no doubt a must-know command for any and everyone who works on the command line in Linux, there are several other related (and in-depth) details that you should know in order to use the command more responsibly and effectively. And that's exactly what we'll be discussing here in this article. But before we move ahead, it's worth mentioning that all the commands and instructions mentioned in this article have been tested on Ubuntu 14.04LTS with Bash shell version 4.3.11. The sudo command, as most of you might already know, is used to execute a command with elevated privileges (usually as root). An example of this we've already discussed in the introduction section above. However, if you want, you can use sudo to execute command as some other (non-root) user. The /etc/sudoers file controls who can run what commands as what users on what machines and can also control special things such as whether you need a password for particular commands. The file is composed of aliases (basically variables) and user specifications (which control who can run what). 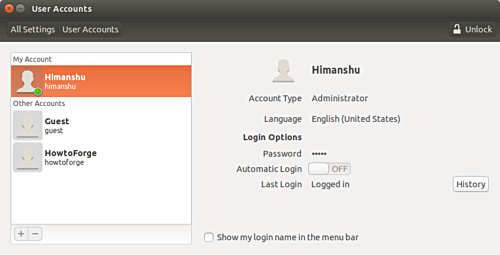 If you are using Ubuntu, it's easy to make sure that a user can run the sudo command: all you have to do is to make that user account type 'administrator'. This can be done by heading to System Settings... -> User Accounts. visudo edits the sudoers file in a safe fashion. visudo locks the sudoers file against multiple simultaneous edits, provides basic sanity checks, and checks for parse errors. If the sudoers file is currently being edited you will receive a message to try again later. For more information on visudo, head here. If you use the sudo command frequently, I am sure you'd have observed that after you successfully enter the password once, you can run multiple sudo commands without being prompted for the password. But after sometime, the sudo command asks for your password again. This behavior has nothing to do with the number of sudo-powered commands you run, but instead depends on time. 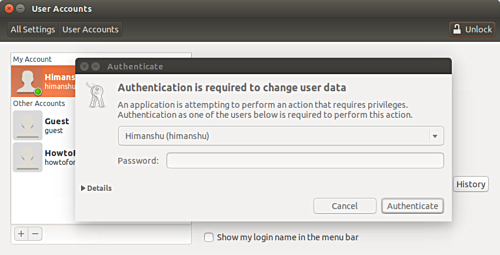 Yes, by default, sudo won't ask for password for 15 minutes after the user has entered it once. Post these 15 minutes, you'll be prompted for password again. The [new-value] field should be replaced by the number of minutes you want your sudo session to last. For example, I used the value 40. In case you want to get prompted for password every time you use the sudo command, then in that case you can assign the value '0' to this variable. And for those of you who want that their sudo session should never time out, you can assign the value '-1'. Please note that using timestamp_timeout with value '-1' is strongly discouraged. As you might have observed, whenever sudo prompts you for a password and you start entering it, nothing shows up - not even asterisks that's usually the norm. While that's not a big deal in general, some users may want to have the asterisks displayed for whatever reason. Now, whenever you'll type the sudo password, asterisk will show up. Aside from the -u command line option (which we've already discussed at the beginning of this tutorial), there are some other important sudo command line options that deserve a mention. In this section, we will discuss some of those. Consider a case where-in you've just run a sudo-powered command after entering your password. Now, as you already know, the sudo session remains active for 15-mins by default. Suppose during this session, you have to give someone access to your terminal, but you don't want them to be able to use sudo. What will you do? There might be times when you work requires you to run a bucketload of commands that need root privileges, and you don't want to enter the sudo password every now and then. 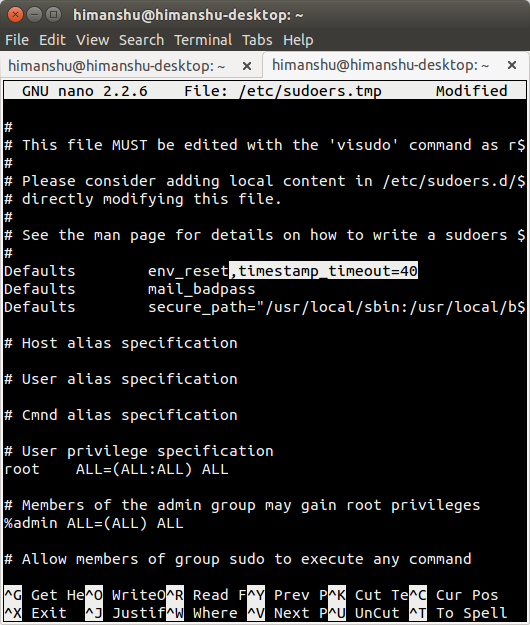 Also, you don't want to tweak the sudo session timeout limit by making changes to the /etc/sudoers file. Launches a new shell - as for which shell, the SHELL env variable is referred. In case $SHELL is empty, the shell defined in the /etc/passwd file is picked up. If you're also passing a command name along with the -s option (for example: sudo -s whoami), then the actual command that gets executed is: sudo /bin/bash -c whoami. If you aren't trying to execute any other command (meaning, you're just trying to run sudo -s) then you get an interactive shell with root privileges. What's worth keeping in mind here is that the -s command line option gives you a shell with root privileges, but you don't get the root environment - it's your .bashrc that gets sourced. This means that, for example, in the new shell that sudo -s runs, executing the whoami command will still return your username, and not 'root'. The -i option is similar to the -s option we just discussed. However, there are some differences. One of the key differences is that -i gives you the root environment as well, meaning your (user's) .bashrc is ignored. It's like becoming root without explicitly logging as root. What more, you don't have to enter the root user's password as well. Important: Please note that there exists a su command which also lets you switch users (by default, it lets you become root). This command requires you to enter the 'root' password. To avoid this, you can also execute it with sudo ('sudo su'); in that case you'll just have to enter your login password. However, 'su' and 'sudo su' have some underlying differences - to understand them as well as know more about how 'sudo -i' compares to them, head here. I hope that by now you'd have at least got the basic idea behind sudo, and how you tweak it's default behavior. Do try out the /etc/sudoers tweaks we've explained here, also go through the forum discussion (linked in the last paragraph) to get more insight about the sudo command. Thanks for the method to change the timeout. Sudo isn't just about gaining root. It can be used to runAs other userids. This can be extremely convenient in a corporate environment. Sudo can be used to limit which options a specific command allows for specific userids or groups. Perhaps the secretary needs to manage a printer queue? Or perhaps you don't mind if everyone can manage the printer queue? Use sudo with specific limitations on lp to do that. Or perhaps a developer needs access to 1 specific log file. Don't give her generic sudo - provide limited sudo that shows only the logfile ... or a grep of the log file. Also, sudo can be setup to prevent those using an editor from shelling out as root and competely owning the box. Actually, sudoedit is really the command to be used for editing system files. Only the file copy to temp and back is done with elevated priviledges. The actual editing is performed under the normal userid with whatever EDITOR has set. Sudo is an amazing tool. It provides a way to honor the principal of least privilege on our systems. $ sudo -k , --reset-timestamp and now i am stuck please help me out.